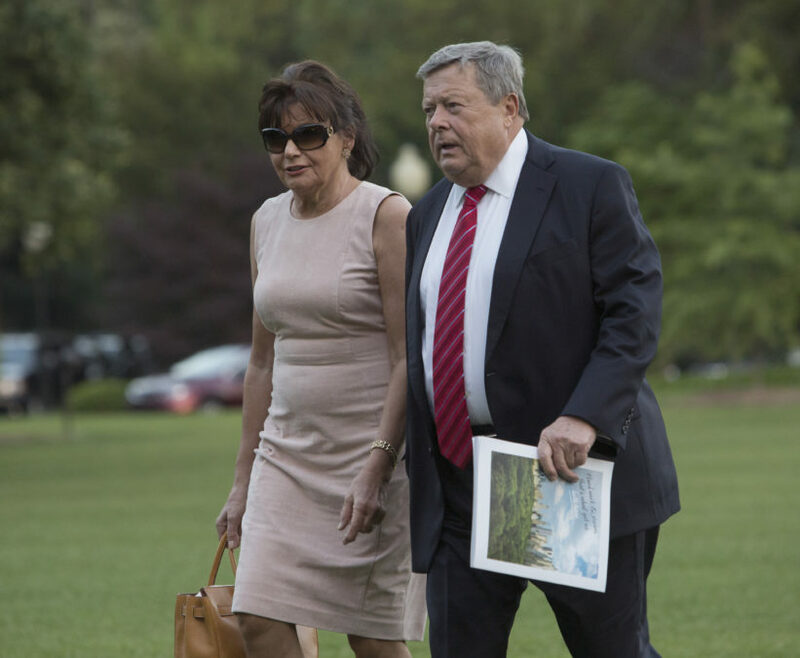 Viktor and Amalija Knavs, the parents of first lady Melania Trump, arrive at the White House after a trip to New Jersey with the Trump family in 2017. The recent revelation that first lady Melania Trump’s parents have green cards settles one major question about their immigration status and provides clues about how long the two have lived in the United States. But it also raises more questions. Attorney Michael Wildes, who handles immigration matters for Melania Trump’s parents, confirmed that Viktor and Amalija Knavs are indeed green card holders. In an email to Reveal from The Center for Investigative Reporting, Wildes declined to comment further on the matter, citing privacy concerns. The Washington Post was the first to report the news about their status last month. In order to qualify for citizenship in the United States, applicants must first have a green card. Those cards can be acquired in only one of eight ways. It’s likely, but not certain, the Knavses gained status through their daughter by taking advantage of family reunification. Obtaining a green card through the program allows immediate family members the opportunity to eventually gain citizenship. According to The Washington Post story, the Knavses are waiting to book their citizenship ceremony. That would mean they’ve already applied for citizenship, a process that can take a year or more. It’s unclear whether the couple has already had their fingerprints taken. If that step has been completed, the Knavses would be subject to a formal interview, an English-language test and a civics exam. The final step – the citizenship oath itself – is sometimes part of a ceremony held in cities across the country several times per year. Their attorney didn’t answer questions from Reveal about whether the Knavses, who reportedly lived in Slovenia before joining their daughter in the United States, have indeed applied for citizenship. If Viktor and Amalija Knavs are nearly set to participate in a citizenship ceremony, that means the two probably had green cards for at least seven years. Naomi Cruz, a Los Angeles-based immigration attorney, said it takes about one year to apply for legal permanent residence and five years of residency before one is eligible to apply for citizenship. The two may have held green cards much longer than five years and only recently decided to apply for citizenship. Part of the allure of family reunification – and why attorneys often recommend it over other categories – is there’s no quota for the number of immediate relatives who can benefit. “(Melania) has status, so the only logical thing for her to do is to petition for her parents,” Cruz said. People seeking to enter the country through family reunification are subject to review by the U.S. government and may be considered inadmissible if they’re found to have committed fraud, been convicted of a serious crime or are suspected to be drug users. If the foreign relative of a U.S. citizen is in the country on a tourist visa, he or she may overstay that visa and still be eligible for a green card through an exception. It’s unclear if the Knavses first obtained a green card through a consulate and traveled to the United States as legal permanent residents or if they entered as tourists, overstayed their visa and later obtained green cards. If the Knavses obtained a green card through family reunification, Donald Trump’s name would be listed on their application as Melania Trump’s spouse. Obtaining a green card through family remains popular for its ease and speed; it’s also a program the White House wants to cut. About 65 percent of people who obtain legal permanent residence do so through the family-based system. The wait for green cards is sometimes severely backlogged, varied by family relationship and country of origin. If at least one of the Knavses invested $1 million in a U.S. project, they both would be eligible to petition under this category. Or if at least one of Melania Trump’s parents worked for a company in their home country and was transferred by that company to work in the United States, both could qualify for a green card through employment. But that means the company would have to petition for them. “You have to jump through a lot of hoops by either investing a ton of money or have an employer go through the Department of Labor for you,” Cruz said. After entering the United States on a visitor’s visa, Melania Trump herself gained legal permanent residency through employment. The Associated Press reported that she worked for several weeks as a model in the country before she had legal permission to do so. It’s unlikely the Knavses served as Afghan or Iraqi translators, are religious workers employed by a nonprofit religious organization, were hired as international broadcasters as members of the media in the United States or work for NATO. And, because both are reported to be in their early 70s, they’re not what the government calls special immigrant juveniles. Unless they meet one of these requirements, the Knavses don’t qualify as special immigrants. People who are fearful of persecution as a result of remaining in or returning to their home countries can apply as refugees through a program that gives the highest preference to people referred through a U.S. embassy, a nongovernmental organization or the U.N. High Commissioner for Refugees. Asylees are people who are already in the United States or have just arrived at a port of entry and claim fear of persecution if they were to return home. But it might prove difficult for the Knavses to claim asylum. “If you have a daughter who’s a citizen, no attorney would tell them, ‘Hey, apply for asylum,’ ” Cruz said. “Just go for family-based” immigration. T-visas are issued for victims of trafficking. To qualify for this visa, and later a green card, the Knavses would have to be smuggled into the country. U-visas are issued for victims of qualifying crimes, including someone using a tourist visa to visit the country. Cruz said that the program wasn’t popular until the early 2000s and that if the Knavses had applied within the last five years, they’d likely still be waiting and wouldn’t have green cards. “It would also have to be for something pretty extreme that happened to them, like someone holding a gun to their heads,” she said. Some of the categories listed here, such as the abused parent of a U.S. citizen or special immigrant juveniles, overlap with those in the green cards through family program. Others include family members of people who originate from Cuba or Haiti. The Knavses are from Europe; Viktor Knavs is reported to have been born in Slovenia, and Amalija Knavs is reported to have been born in Austria. Several of these categories are designated for people who originate from communist (or formerly communist) regimes, such as Cuba, Vietnam and the Soviet Union. There’s another category for Native Americans born in Canada. Two more apply to people born in the United States whose parents were diplomats. Since the Knavses are from Europe, they wouldn’t qualify under these categories. There’s also the diversity lottery. Citizens from some countries don’t qualify for the lottery, and those from countries that do qualify have set quotas. “Why would you go through all of this if you have a daughter who’s a U.S. citizen?” Cruz said. This applies to people who have been in the U.S. since Jan. 1, 1972. “I highly doubt this would apply to (the Knavses), unless they were hiding all along,” Cruz said. It remains unclear how long the Knavses have been in the United States. Aura Bogado can be reached at abogado@revealnews.org. Follow her on Twitter: @aurabogado.